Seedless watermelons are definitely easier to eat than watermelons with seeds – there is way less mess when you don’t have to worry about the seeds! Did you ever wonder how seedless watermelons are grown? It seems pretty counter-intuitive. Watermelons are grown from seeds. So if a seedless watermelon plant doesn’t make seeds, how do we get more seedless watermelons? Seedless watermelons are created by selective breeding. A regular watermelon plant has 11 pairs of chromosomes, or 22 chromosomes total. These plants are called diploid (di = 2, for the 2 pairs of chromosomes). When the plant gets ready to reproduce (make fruit), it makes flowers and pollen. The flowers contain egg cells, which have one chromosome from each pair, or 11 chromosomes total. The pollen is the male cell, and it also has one chromosome from each pair, or 11 chromosomes total. When the flower is pollinated, the egg and pollen cells join, making one new cell with 22 chromosomes (11 from the egg and 11 from the pollen). This cell multiplies like crazy, and eventually turns into the watermelon fruit with the hard, dark seeds we are used to seeing. Let’s call the regular watermelon plants “22 plants,” for their 22 chromosomes. In order to get a seedless watermelon, we actually need to start with a watermelon that has too many chromosomes. While extra chromosomes in people can cause problems, extra chromosomes in the plant world is really common. Strawberries often have extra chromosomes. A “regular” strawberry plant has 2 sets of chromosomes, but some species have up to 10 sets of chromosomes! Because there is an odd number of chromosomes in the 33 plant, reproduction doesn’t work very well. Actually, it doesn’t work at all. The chromosomes don’t divide evenly into the egg and pollen cells, so these plants are actually sterile. If you were to plant an entire field of 33 seeds, you would get plants to grow, but you wouldn’t get any watermelons. It’s sort of like mating a horse with a donkey. You would get a mule – which is great, if you like mules. But mules are sterile. You can’t mate two mules together to get more mules, you have to mate a horse with a donkey to get another mule. So, a 22 plant (a horse) plus another 22 plant (another horse) give us a 22 plant (a baby horse). The 22 plant makes watermelons with seeds. And a 22 plant (a horse) plus a 44 plant (a donkey) gives us a 33 plant (a baby mule). The 33 plant makes watermelons with seeds. If you want more 33 plants, you can’t plant the 33 seeds – you need to have another 22 plant (a horse) plus another 44 plant (a donkey). But so far we haven’t found the elusive seedless watermelon yet… Now what? The flowers on the 33 plant need to be fertilized by pollen from a 22 plant. This is where seedless watermelons come from. Once this fertilization happens, the fruit can grow. This fruit is a seedless watermelon! Sometimes “seedless” watermelons will have small white seeds inside. These are the seed husks. They are not mature seeds. If you tried to plant them, they wouldn’t grow. The genes inside a watermelon plant have not been changed to make it grow seedless watermelon. There are just extra copies of every gene. This means that seedless watermelons are not GMOs (genetically modified organisms). 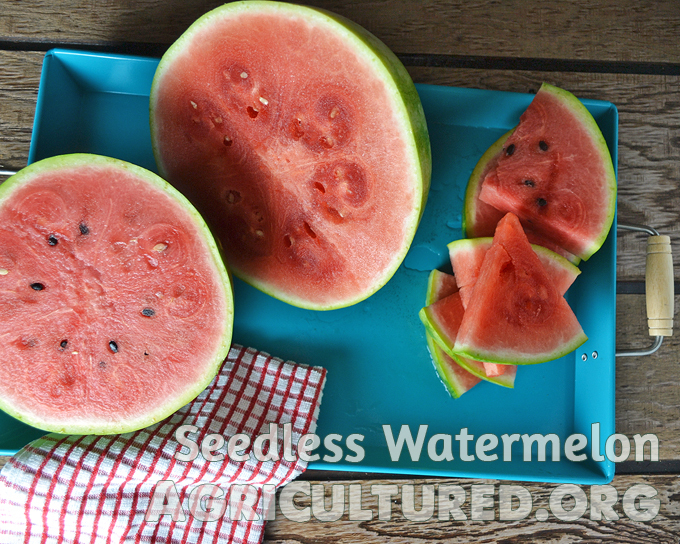 Whichever your preference, seedless or seeded, be sure to enjoy plenty of watermelon!